Boris Johnson slams 'perverse' boycott of Israeli journalist by Palestinians; meetings cancelled over protests of pro-Israel mayor. London Mayor Boris Johnson has been outspoken in his opposition to boycotts of the State of Israel during his trip to Israel and the Palestinian Authority. But his trip to the PA has already been marred on its first day after a Palestinian women's group opted to boycott an Israeli journalist covering Johnson's trip. Noga Tarnopolsky is covering events for London's Jewish Chronicle, but was informed by the Palestine Women’s Business Forum - via the British consulate - that she would not allowed to attend their event in Ramallah, where the London Mayor is to hear business pitches from young Palestinian Arab women. 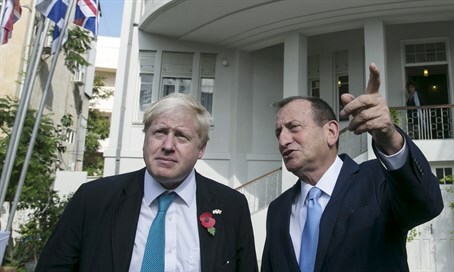 According to British Jewish journalist Justin Cohen, who is traveling with the mayor, Johnson slammed the boycott decision as "perverse," and said he would ask the Forum to change their decision. However, Johnson's itinerary in the Palestinian Authority in general appears to be in jeopardy, after two of three meetings scheduled for Wednesday in Ramallah were cancelled, while the third - a meeting with PA Prime Minister Rami Hamdallah, will be held without any foreign media present, although Palestinian media will be given a chance to grill him. At least one of the meetings was cancelled due to security concerns, after calls to protest the Mayor's visit over his support for Israel spread on Twitter. No reason was given by the PA for the other changes in arrangement, although Johnson's support for Israel is the most likely reason. The Sharek Youth Forum, which also cancelled a meeting with Johnson, issued a statement saying it had done so to protest his "inaccurate, misinformed, and disrespectful statement" about the anti-Israel boycott movement, whose supporters he branded as "a bunch corduroy-jacketed lefty academics." "As Palestinians and supporters of BDS, we cannot in good conscience host Johnson, a person who denounces the international BDS movement and prioritizes the feelings of wearers of ‘corduroy jackets’ over an entire nation under occupation," the told the UK's Independent. The Mayor is in Israel and the Palestinian Authority to promote business opportunities in London, and has lavished praise on Israeli innovation and technology.